August 7 is National Friendship Day, so I thought I'd write about Darla Barclay, who was my best friend. I met her in June 1971 when I moved from Philadelphia next door to her in Palo Alto. I knew no one. She befriended me immediately, and showed me around town and Stanford University: the Co-Op Market (no non-union grapes), Bing Nursery School at Stanford (my oldest son and her daughter were 3), and Foothills Park (Palo Altans only!). She introduced me to many of the wonderful things the Bay Area had to offer (and still does): the Oakland Museum, the Oakland and San Francisco Zoos, the Stanford Art Museum (now the Cantor), and all of the art museums of San Francisco. We visited gardens and beaches, and we hiked in state parks. Through the years, she helped me navigate a painful divorce, a new marriage, a difficult pregnancy, and the death of my young husband. She celebrated with me when I married yet again. She loved my sons as if they were her own. Our friendship lasted nearly forty years, until she died of esophageal cancer at the age of 69 in 2010. Darla was an only child, which she said gave her the right to choose her siblings. I became her sister. One thing we didn't have in common was my love of 19th Century English pottery. She liked modern, simple things. She loved me despite my passion for pottery. 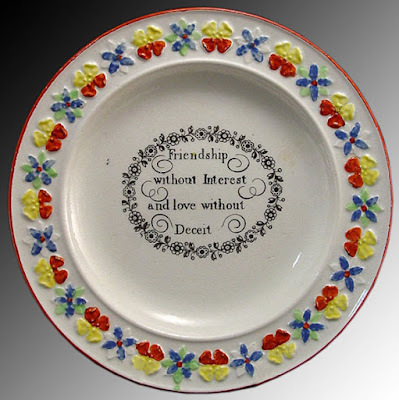 There are a few transferware patterns that are about friendship. The sentiment on the plate below sums up my friendship with Darla. She would have liked the concept, but would have hated the plate. "Friendship without Interest and love without Deceit" child's plate or lover's gift, ca. 1820. I once gave her a mug similar to the ones below. She gave it back! 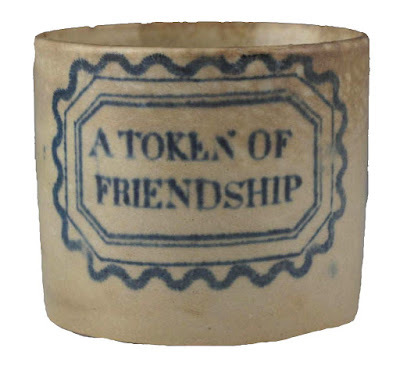 "More Friends And Lefs (Less) Need of them" 3 inch mug. The saying is from an old drinking toast. "A Present from a Friend" 2 inch child's mug. 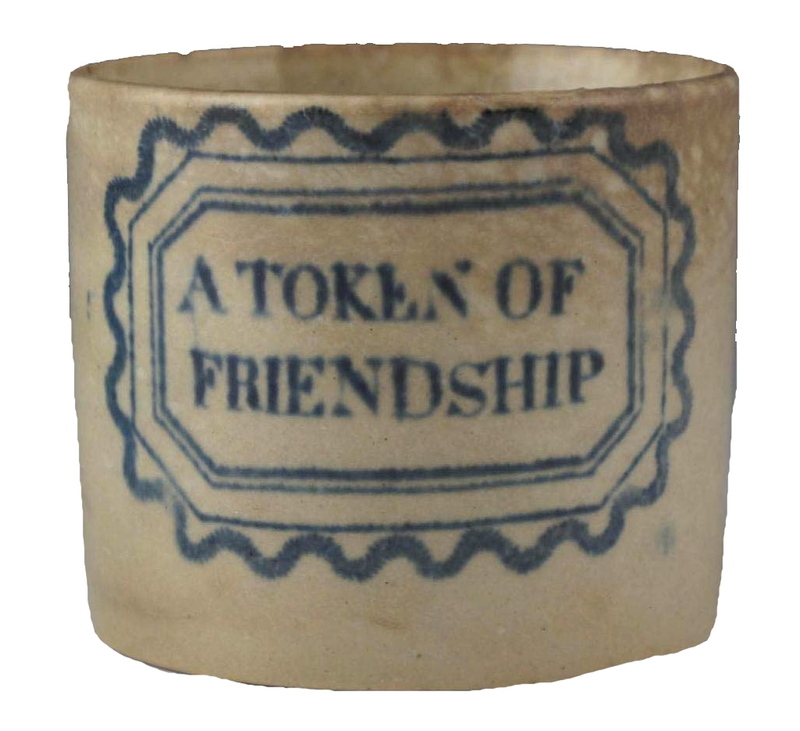 "A Token Of Friendship" 2.12 inch child's mug . "A Present for a Friend" 2.25 inch child's mug. A few more things. Darla was smart and beautiful. She had a terrific sense of humor. 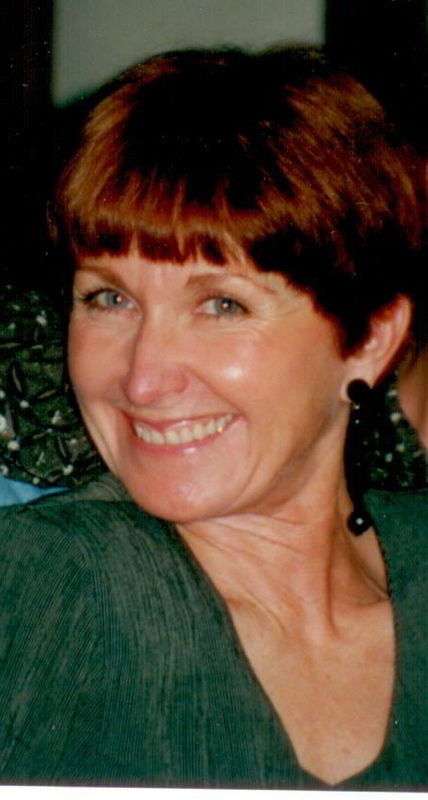 She was an outstanding gardener, an interior designer (her vocation), and a loving mother, daughter, and friend. I miss her every day. A lot of us have lost a close friend. We never stop missing them, do we?